1992/AH1412. Dull red-brown on pale orange, lilac and multicolour underprint. Color shade varieties. Temple at center. Saddam Hussein at right. Signature 24. Back: Hammurabi in conversation with the sun god Shamash at left. Tomb of the unknown soldier in center. Printer: Chinese. UV: threads fluoresce blue and orange. Figure 1: The front of the 5-dinar note issued by Iraq, dated 1992. Saddam Hussein is at the right and the temple at al-Hatra is in the centre. Figure 2: The back of the 5-dinar note, depicting Hammurabi receiving his symbol of authority from Shamash the sun god and the Monument to the War Dead in Baghdad. There are elements of these terse descriptions which need clarification, but what is of interest to collectors is the description of the three varieties. There has been confusion from collectors as to what the Standard Catalog of World Paper Money refers to as the ‘border’, how to recognize it, and does it really determine a variety? Before addressing the varieties, let’s look at the note. On the front, to the right is Saddam Hussein (1937–2006) who was the president of Iraq from 1979 to 2003. The text across the top of the note reads ‘Central Bank of Iraq’, beneath which is the Gregorian and the Hejira dates: 1992 – 1412. The text below the dates reads ‘Five dinars, banknote issued under law by the Central Bank of Iraq’. Finally the signature of Tariq al-Tukmachi and his title ‘Governor’ is printed toward the bottom of the note. In the centre is an orange and white image of the Temple of Shamash (the sun god) at the ancient site of ‘al Hatra’, located 100 kilometres south of Mosul. The small text below the image reads ‘al Hatra’. On the back of the note (see Figure 2), to the left, is an illustration of Hammurabi (at the left) receiving his symbol of authority from Shamash. Hammurabi was the sixth king of Babylon and Shamash was the Mesopotamian sun god and the Babylonian god of justice. The image is copied from a sculptured relief on a stele listing the Code of Hammurabi. Depicted in the centre on the back of the note is the Monument to the War Dead in Baghdad, which contains the remains of the Unknown Soldier. The Arabic text at the lower right reads ‘The Unknown Soldier’. The main text on the back of the note is in English. The notable characteristic of the 5-dinar note when it was issued is the embossed elements of the note (see Figure 3). 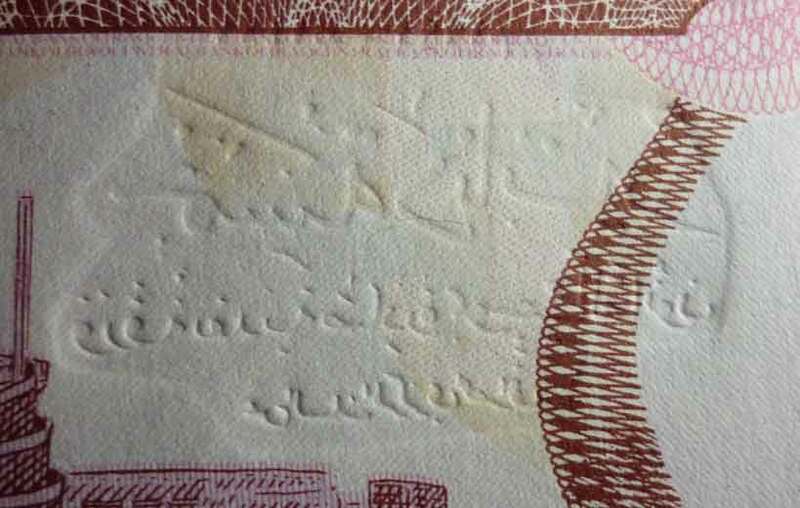 All the text on the front of the note is embossed, with the exception of the signature and the title of the illustration (al Hatra). In addition, the imitation intaglio work and the patterns holding the denominations in the four corners are embossed. According to the Standard Catalog of World Paper Money it is this embossing which determines three varieties. Figure 3 – The embossing for the 5-dinar note is shown in these two images; with the front (at left) showing the printed text imperfectly aligned with the embossed impression (without the border), and the back (at right) showing the embossed impression on the same note. The varieties are supposedly determined by a ‘border’, but it is not a printed border. 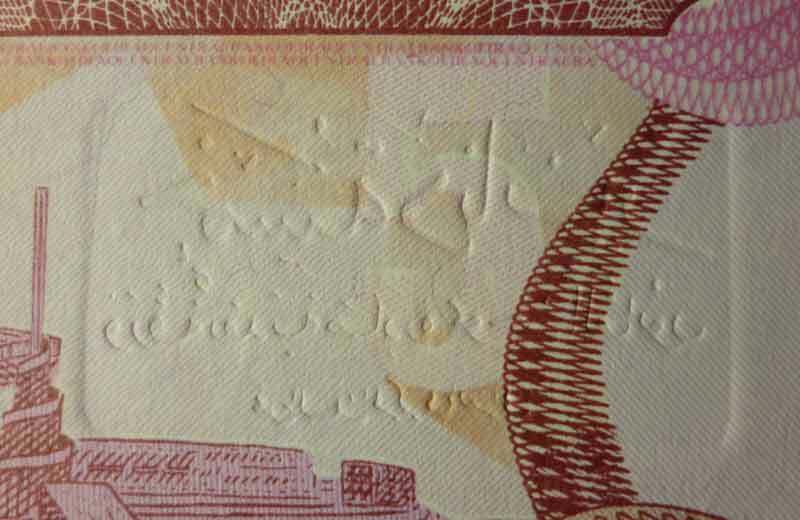 Rather, the border is distinguished by an outline of the plate which embosses the text reading ‘Five dinars, banknote issued under law by the Central Bank of Iraq’. Simply, the plate which creates the embossed area should be flush with the area on which the notes sit when the embossing takes place, but for many of the notes the plate is raised above the flat area and an embossed border appears around the note. To undertake a study to investigate the ‘varieties’ of this note, 161 notes were examined, of which 132 carried prefixes from 1 to 100. It is apparent from this sample the embossed border around the note does not appear on serial number prefixes from 1 to 20. The raised border then appears on notes with serial number prefixes from 21 to 100; but equally within this range are notes with no raised border. Similarly, the quality of the embossing varies on the notes in this prefix range, from quite distinct embossing to barely noticeable embossing. The embossed border, when it is apparent, outlines a contour around the extent of the text. On a very few samples, the embossed border can be seen to join the raised area which embosses the patterned panel containing ‘The Central Bank of Iraq’. Curiously, on one sample with serial number prefix 103, the embossed border around the text is a rectangle with curved corners. This suggests a new printer was used or possibly new plates were prepared for the embossing the text. Within the sample used for this study, the last prefix recorded for a note with embossed text is 165. After that, all notes recorded have no embossed text, with serial number prefixes going at least to 500. Figure 4 – Viewed from the back of the notes, the two types of ‘border’ are shown here. The left-hand image shows the border contoured to the text, while the right-hand image shows the rectangular border. For collectors who have put aside a number of the 5-dinar notes, it is obvious there are colour varieties for these notes, where the control of printing has been quite poor. Equally, the process of embossing the notes has been quite poor. In cataloguing the varieties of these notes, it is curious the colour varieties are not identified, but some attempt is made to catalogue the results of poor production of the embossed text. Another element subject to quality control failures is the fluorescent features on the banknotes. All 5-dinar notes of this type carry fibres embedded in the paper which fluoresce under ultra-violet light. The fibres are either yellow or blue when they fluoresce. Also included on the front of most notes is the Arabian numeral for ‘5’ (i.e. ‘٥’), repeated to the left and right, which fluoresces yellow when submitted to ultra-violet light. Typical of the quality controls for the notes in this series, the numerals appear in a range of qualities – from extremely bright to being barely detected. It would be easy for the casual observer to say the fluorescent ‘fives’ are not on some notes, when in fact they are simply very faint. Checking the entire sample of notes under ultra-violet light it is found the later notes are printed on a type of paper which does not fluoresce. Notes printed on the non-fluorescing paper do not have the fluorescent ‘fives’. The notes printed on non-fluorescing paper start with a serial number prefix somewhere between 253 and 311. Importantly, on some of the earlier notes, the paper throws less fluorescence than most notes, so some of the earlier notes may use a slightly different paper, or possibly of different inks. Not embossed – with non-fluorescing paper and no fluorescent Arabic fives.